When the company formerly known as RIM introduced the BlackBerry Z10, our early impressions were positive, but guarded. No phone can live up to the anticipation and expectations put on it by skeptics and fans alike. Still, the Z10 represents a really good effort on the part of BlackBerry. It can claim a solid design, up-to-date hardware and a modern operating system. But is that enough? The Z10 might have what it takes to stop BlackBerry's core audience of business customers from abandoning the platform and draw previous users back. Whether it also appeals to the more mainstream audience that currently embraces Android and the iPhone is a different matter. It's not just about the hardware (except when it is) and it's not just about the operating system and apps (except when it really is). It's about what the BlackBerry Z10 is built to do best and if that purpose fits your life. 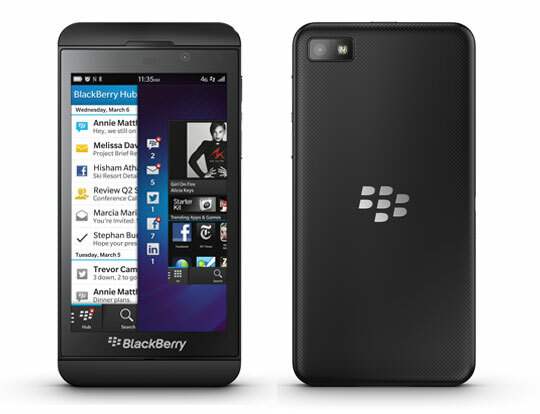 Starting with design, I think it's fair to say that the Z10 looks like an iPhone 5 in a three piece suit. It's easy to mistake one for the other at a glance (and I'm sure many will) until you notice the Z10's logo. However, there are important differences. BlackBerry's device has a soft-touch back that curves at the edges instead of glass and a hard right angle. Overall, this is a very holdable and comfortable phone thanks to a combination of the light weight, the slight curve on the back edges, and the balance. It's easy to use one-handed, something many people value in a smartphone, large screen or not. Most people will be able to reach across and up near the top of the screen with just a thumb and pull off all the swiping gestures with no problem. The 4.2-inch display bears a pixel-dense HD resolution of 1280 x 768 that makes everything from web pages to video and pictures look great. Unfortunately, the screen is not as bright or color-rich as the competition, including the iPhone 5, the HTC One series, and the Galaxy S III. It's still bright enough to be used in sunlight. The heart of the BlackBerry experience has always been messaging, and in BB10 that's even more true thanks to the BlackBerry Hub universal inbox. The Hub aggregates a multitude of messages ranging from email and BB Messenger to social networks like LinkedIn and Facebook to instant messaging services to texts and calls on the phone itself. All these services in one place could end up looking messy and unorganized -- not so on the Z10. The Hub manages to keep it clean and streamlined so that keeping up with various digital communications is easy and not a chore. The message-first mentality is only served well if it’s easy for people to write and respond, and that requires a good keyboard. Most BlackBerry offerings of the past went with physical keys. 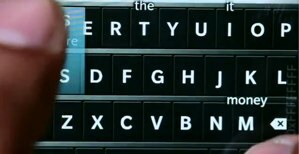 The Z10’s challenge is to offer just as good an experience with an on-screen keyboard. The Z10's keyboard is among the best for touch devices and clearly designed for both efficiency and speed -- just what message heavy users want. It pulls this off by offering a clean design with plenty of space between keys and offering quick, one swipe ways to delete words, access punctuation, and more. There's a predictive text engine that learns as you type and offers up words you can simply flick into your sentences. In the early days that predictive text probably won't be as much use because the text is tiny and hunting for the right word is slower than actually typing it in most cases. Since the predictions appear on top of the letter you're likely to type next, it's easy to flick them up to choose. As the keyboard learns, you won't need to hunt for the right word and might even compose the bulk of a sentence with just a few taps. On the narrow Z10, one-handed typing is a possibility, but those who like to do it with two hands won't find the keyboard too cramped. As good as this typing experience is, it's still only good for a touchscreen device. Physical keyboards are often better for speed and accuracy, and if you have wide fingers, fingernails, or any other thing that usually gets in the way, the Z10's keyboard won't solve those issues. We had no trouble executing BlackBerry 10's swiping gestures, which are key to the Z10's operation. In this touch-only format the lack of Home button feels odd at first but quickly mastered after just a few hours of use. The gestures are easy to remember and efficient, and most of the time I didn't have to do them more than once. The exception is when the Z10 is in landscape position, swiping "up" (the default gesture) means swiping from the edge. There isn't much bezel on the left and right, which meant that the gesture didn't always register. It would be better to make the movement universal from one specific place; to always swipe from the logo, for instance. You'll want to keep the touchscreen clean, because it's normal responsiveness and accuracy go down once the smudges start to build up. And they do at an annoying rate, so be prepared to clean it more than occasionally. Also worth mentioning is the Z10's Voice Commands utility. It includes a speech-to-text engine, giving users another easy way to compose short messages, and can accept basic commands such as Tweet X or Send A Message To Y. It lacks the conversational commands that make Siri so much like an actual personal assistant, though here that doesn't feel like an oversight. After all, Siri sometimes just doesn't work. At least the Z10 isn't over promising in this area. Inside the phone is a dual-core processor and 2GB of RAM. This combination results in a speedy, responsive device that handles multitasking and resource-intensive apps really well, such as screen sharing in BlackBerry Messenger. With BBM you can show off whatever is on the screen in real time without much lag. And when not sharing the screen, everything from the interface to switching between apps to playing games was smooth. The only issue is that the phone got noticeably hot when taxed. BlackBerry touted a 70,000+ app selection at launch, which is an impressive number. The reality of BlackBerry World, the app store, is less awe-inspiring. There are a lack of quality apps included in that number, and many top apps are currently missing. If you’re not satisfied with what you have on the Z10 out of the box, you might get frustrated trying to fill the holes by searching through BB World. Browsing the store, I found many apps aimed at mainstream users who do more with phones than just business communication. That can be a good approach, especially since BlackBerry seems bent on appealing to more than just the business customers. But the apps themselves aren’t inspiring. Just like any fledgling market, there are a slew of bad, ill-designed apps, rip-offs of apps from other stores, and overpriced-for-what-they-do apps. It’s easy to forget that these issues plague every new app store, even iTunes way back when. Still, touting quantity over quality will win BlackBerry no fans. New to BlackBerry World are sections for music and video that take advantage of the Z10’s beautiful screen and decent audio. The selection is better than for apps, but when compared to iTunes, it doesn't compare. Plus, the content can only be played on the Z10–a big drawback. 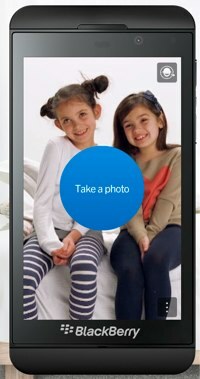 If you want to add your own media to the Z10, BlackBerry makes that easy. 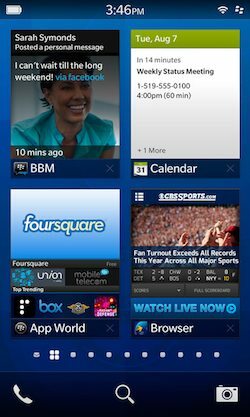 The BlackBerry Link desktop software was designed to go with BlackBerry 10 and will install the first time you plug the Z10 into your computer. For music and video, Link accesses the Windows Media Player or iTunes libraries and makes it easy to transfer non-DRM files back and forth. It also syncs photos and documents, plus backs up data and uploads updates. After you set it up, Link doesn’t even require a wired connection to work—it will also sync over Wi-Fi. We found Link easy enough to use and simply designed, like BB10 itself. Unfortunately, the software caused our Windows 8 computer to crash several times when we left it open and the Z10 connected. A Windows 7 install did not suffer the same problem. The 8 megapixel camera on the back is capable of taking some great shots. The camera app doesn't offer a lot of help—there are minimal options and settings—though does get shots focused quickly. Photos have good color balance in bright light and a surprising amount of detail in low light. The flash is more helpful than on some competing phones since it doesn't blow out people with lighter skin or light objects in dark spaces. The 1080p video it records is also very crisp and rich. The microphone picks up audio well and can smooth out noisy environments. The front-facing camera is 2 megapixels, higher than average for smartphones. This is a bonus when video chatting in BlackBerry Messenger. Our chat partner reported that our video came through clearly enough to see detail and color is pretty accurate. The browser offers a mix of good and bad which adds up to a more frustrating experience than we'd like. Overall, the interface is minimal and spare, probably so that it will work well on small screens (like the Q10) as well as big screens on full-touch models. It's at least well-designed, with often used menu items such as Share, Bookmark, and Add Tab just one tap away. Much of the time websites loaded quickly whether we were on Wi-Fi or on T-Mobile's 4G network. Some websites made the browser hang badly without giving any indication as to why. By default, Adobe Flash support is off and that seemed to be the stumbling block in some cases. In others, the cause was a mystery and the browser would take a minute or more to load everything. There's no option to force the browser to load only desktop or mobile versions of websites, so when they're available the mobile site loads. Though the browser can handle full sites to an extent, the size of the display necessitates zooming in most of the time. The Reader mode alleviates this problem, stripping out ads and formatting so you can concentrate on content. This is especially nice when reading longer articles and posts. The back of the phone is removable to give access to the battery, SIM slot and microSD slot, which takes cards up to 32GB. The Z10 itself has 16GB of internal memory. We found the battery life on our T-Mobile version to be on par with most other smartphone's we've tested. The Z10 easily lasted through the day under "normal" use, which for us meant occasional email, web browsing and a little bit of gaming. 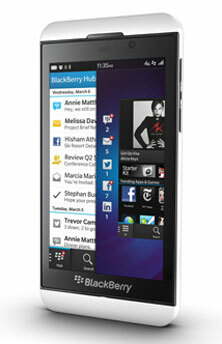 The BlackBerry Z10 is available for pre-sale from AT&T for $199.99, with availability on March 22, 2013. Overall, the BlackBerry Z10 is a nice piece of hardware. Comfortable design, decent display, a worthy camera, and speedy performance. Combined with the benefits of BlackBerry 10, including the message heaven that is the Hub, it could be a compelling smartphone. Thing is, there are a million touchscreen smartphones available and the Z10 doesn't do much to stand out from the crowd other than being a BlackBerry. For those of you interested in how BB10 organizes and contextualizes communication, the Z10 provides a good platform. Still, if messaging is important, will a touch keyboard really satisfy? If messaging isn't that high a priority, what does the Z10 offer that other smartphones don't? Only the new operating system. And right now Android and iOS are more well-rounded in their features and certainly in their app selection. Compared to Windows Phone 8, BlackBerry stands a better chance. The bottom line is that the BlackBerry Z10 itself is a fine phone and will likely serve those who use it well. It doesn't have much to draw in customers who aren't already partial to BlackBerry or who are looking for a smartphone that serves every aspect of their lives, not just communications.